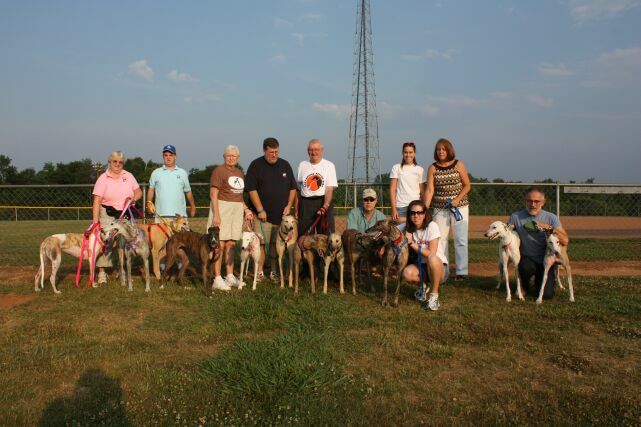 GPA-Electric City, based in Anderson, South Carolina, was recently pleasantly surprised when our group was named a co-beneficiary of a “Greyhound Rescue Ride” organized by a couple we didn’t know! 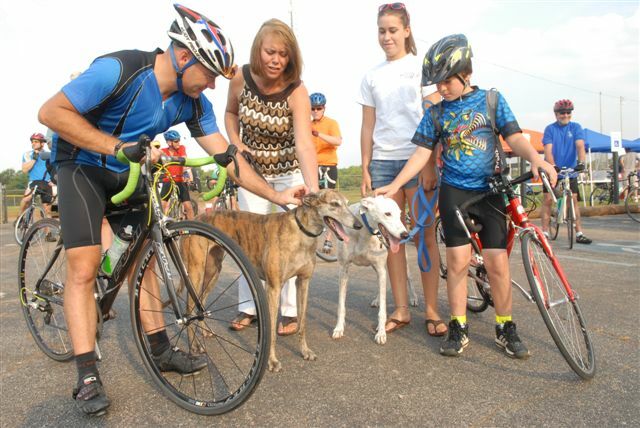 Steve and Lisa Alexander, also of Anderson, have two passions: Greyhounds and cycling. They have two Greyhounds of their own. They wanted to give back to the animal community and they chose our group and the Anderson County Humane Society, a small group that offers low-cost spay/neuter clinics to folks who need assistance paying for this veterinary service. On June 27 ninety-two bicyclists appeared for a bike ride in 94 degree heat starting at 7 AM. How did the Alexanders accomplish this feat? With a lot of work, a well-organized plan with timelines, and lots of good friends (tennis buddies and a couple of co-workers) who are civic-minded people willing to volunteer. 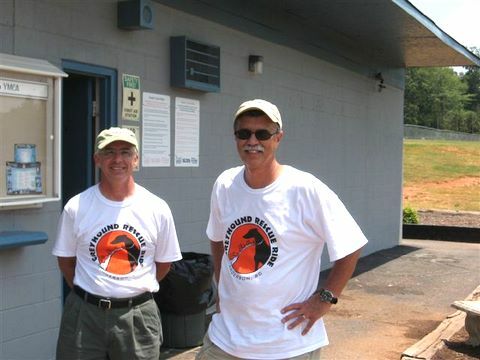 Approximately four months prior to the “GRR” Steve spoke at a meeting of the Greenville (SC) Spinners, a large cycling club. 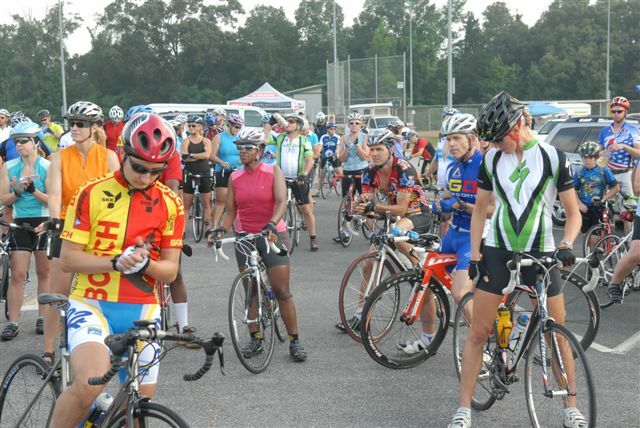 Cyclists in South Carolina are a civic-minded group who like to support charitable causes while riding. They were enthused with Steve’s proposal; as a result of his speaking to the group, Steve planned the ride in earnest. Steve checked around for local facilities to be the event’s home base but was stymied when the rental charges were prohibitive. However, the local YMCA, which has a beautiful park with cooking facilities, picnic tables, paved parking lots, rest rooms, and even a fenced-in ball park for any dogs that might want to run around, offered their facility – at no charge! Another important plus was that this park is convenient to I-85 and is just off a major state highway. This made it easy for people to find. Organizers Bob Luppino and Steve Alexander take a break at the home base. At about the same time, the Alexanders found sponsors for the ride. Several small local businesses donated a sum of money, usually a minimum of $35, for a total of $700. 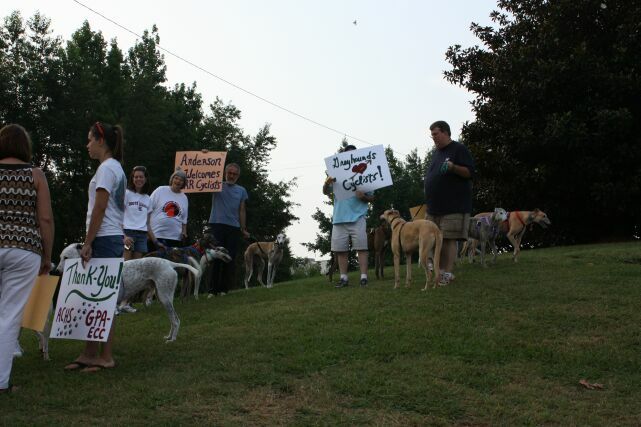 In turn, the donators’ business names were printed on the back of the shirt as advertising. These funds helped in buying T-shirts and food for the event. The front of the shirt has the group event name on it and a colorful, appropriate logo designed by Steve. Tom Dye (DyeDesigns), a friend of Steve’s, turned the design into a digital format for printing. Once the home base was reserved, an avid and extremely helpful cyclist friend of Steve’s, Bob Luppino, created three rides consisting of 25, 40 and 64 miles (metric) and posted it on a cyclists’ rides web site. The rides were all circular; they began and ended at the YMCA facility. As the routes were being created, Steve created a three-fold flyer and then contacted us and told us about his plan. After we recovered from the shock of having a pre-planned major fund raiser handed to us on a silver platter, Steve gave us the flyer for proof-reading and tweaking. After that, Steve printed 800 copies of the flyer, which included a mail-in pre-registration form. Six weeks before the event he put them on windshields at a popular cycling venue. Steve didn’t appear just any old night; he appeared there the night the club rides together and flyered lots of vehicles in one fell swoop. Also, he gave copies of the brochure to all local bike shops in the Clemson-Anderson-Greenville areas for the shops to pass along to their customers. GPA-EC put the flyer on our website, linked the ride routes from the cyclist’s ride web site to our website and the ride was born. Twenty cyclists pre-registered by the cutoff date two weeks before the event and paid a $25 fee; people who didn’t pre-register paid a fee of $30 the morning of the event. 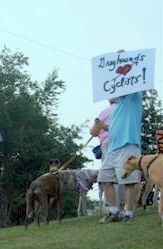 To show the cyclists our appreciation, we assembled a “Line of Gratitude.” About 15 greyhounds and their owners and some folks from the Humane Society and their pets gathered at the starting point and cheered the riders on to the sounds of cowbells, shouts of “Thank you!” and a variety of greyhound-related thank you signs, all prepared by the Alexanders and their devoted crew. After the pre-registrations came in, the nail biting started. One has to procure food and drink for the lunch after the ride and for the rest stops before the return to home base. Knowing whether to buy food and drink for 20 or 200 riders is a challenge. Luckily, after the cyclists registered but before they came in at end of the ride there was time for the volunteers to run over to Sam’s Club and purchase the right amount of food. In South Carolina, “hot dog plates” are very popular fund raisers; it was popular that day too. Gathering the cheerleaders where the cyclists start their rides. Rest stops need two volunteers, refreshments at those points, and “rest” stops as well. Additionally, each rest stop had to make a head count to be sure all riders were accounted for every step of the way. The Alexander’s found a local business, a church, and a generous friend that were willing to let the cyclists stop in their parking lots, have a sports drink and snack and use their rest rooms. The organizers supplied the refreshments, paper goods for eating and for the rest rooms, trash bags, cleaning supplies and the volunteers to do the serving and cleanup work. When the last cyclist came in, the rest stop volunteers cleaned the place inside and out. They then returned to the home base to help cook and serve. We were grateful that the skies were partly cloudy, that the roads were dry and that all came back safely. Despite the heat the cyclists had a wonderful time while participating in a humanitarian ride. The only “to do differently” would be to choose a cooler season or to start the ride at the crack of dawn so that it ends well before noon. This well-oiled machine worked beautifully despite the heat. $3,000 was raised. Thank you Steve, Lisa, volunteers, and cyclists!